Ash-Lilly's Lacquer Lust: 31 Day Manicure Challenge - I'm starting tomorrow! 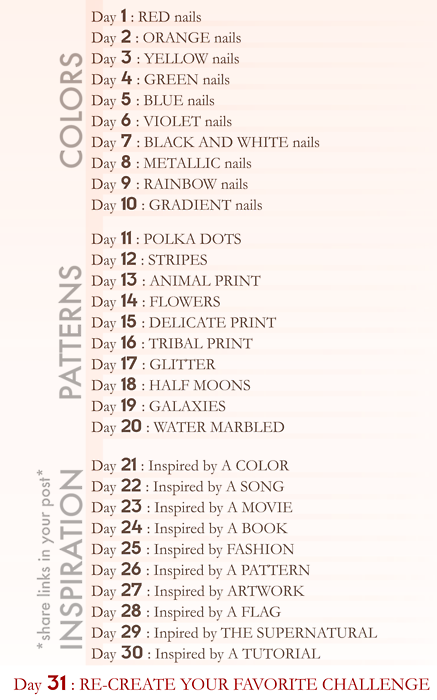 oh nice I'm starting this tomorrow as well, better get working on my red nails! @Ana, I can't wait to see YOURS! I'm already jealous, lol! @Manicure Addict -your nails are a great length so I know your mani's will be stunning. Especially when it comes to the patterns. @Rie, I know. You've done some great mani's already.